I live in Concord, Massachusetts, which is the home of several well-known literary figures: Ralph Waldo Emerson, Henry David Thoreau, Nathaniel Hawhorne, Margaret Fulle, and the Alcotts – Louisa May and her father Bronson were both published authors. I wanted my blog name to tie in to the history and culture of the area, without “pigeon-holing” it into one specific genre. If, for example, I had chosen “Thoreau-ly Books” or another riff on Thoreau’s name, it might seem that my reviews were limited to books about nature and transcendentalism. “She is too fond of books and it has addled her brain” is a line from one of Louisa May Alcott’s novels, Work: A Story of Experience. This is a semi-autobiographical novel set during the Civil War; I’m embarrassed to say that I haven’t yet read it, but I love the quote! It so nicely ties together my love of reading and my interest in the local history. What has been your favorite book you've blogged about so far? Well, I loved loved loved The Lace Reader, but I think my favorite would be one that took me away from an area I was familiar with. Thrity Umrigar’s The Space Between Us and Dalia Sofer’s The Septembers of Shiraz brought me into unfamiliar territory – geographically removed from where I live and in situations that are foreign to me. Both novels taught me a lot about history of their regions and about facets of human relationships I hadn’t seen before. The Genizah at the House of Shepher fits these criteria, too. They all stayed with me long after I closed the books. You went to Salem and took a Lace Reader tour and posted about it. I thought that was such a fantastic idea! What sort of response did you get from that? * My family: The response from my kids was phenomenal – they loved the treasure hunt of finding the different places of interest on the Lace Reader map. We’d like to make another photo tour with a book set in the Boston area – I’m open to suggestions from anyone reading this interview! * Readers of my blog: again, very positive. Everyone enjoyed it, but especially the ones who’ve read The Lace Reader. I didn’t do this on my own, we followed a map that was created by William Morrow, the publisher and is available online. * The author: this was the proverbial icing on the cake! When I met Brunonia Barry at a Lace Reader event a few weeks later I introduced myself. 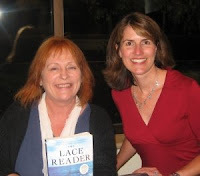 She said, “you’re the one who wrote about The Lace Reader tour, everyone’s talking about it!”. Of course I know that everyone wasn’t talking about it, but it was so cool to know that the author of this novel had read what I had to say about it! Has the way you read books changed since you started blogging? I take notes, which I didn’t do before (except in school, of course). I more apt to be the one recommending books to my non-blogging friends than looking for ideas (my TBR shelf is a bit unwieldy right now, and when that dwindles down I’ve created quite an extensive wish list based on reviews I’ve read on other blogs). What has been something that has surprised you about the world of book blogging? What do you most hope you accomplish with your blog? Great question! I know you work in adult literacy, Amy, and that’s something I’ve been involved with in the past. I worked with adults at a reading lab in college, and then trained and volunteered with a group called Literacy Volunteers of America in Syracuse (they’re now called Proliteracy). Anyway, I’ve had an idea percolating for a few months, and my husband has been working with me to figure out the best way to solidify the idea and promote it. I’m very close to unveiling a slight change to my blog which will push this idea along … stay tuned!! Who else is excited to see what Dawn has in store? Be sure to head over to her blog to see her interview with me! Wow, what a great interview! I've learned so much about Dawn, who has become another feed to add to bloglines. I cannot wait to see what she does with adult literacy. My husband is a student in an adult literacy program in Md, and it has helped him tremendously. I am quite curious to see what she has in store. I've been checking out her blog for a little while now, and this was a great interview. I loved getting to know more about her! I should take notes while reading. Would make for better reviews! I am excited to see what Dawn has in store for us in the future! So many great interviews, and this one is no exception. I especially liked hearing the story of how Dawn came to name her blog as she did. I enjoyed getting to know Dawn better. She seems like an amazing person. I'm glad to know her--even if only online. I read Dawn's blog often, and it was nice to get to know her a bit better. Great interview! Enjoyed getting to know Dawn! Will add her blog to my favorites! Last month I re-read Little Women and last weekend watched the DVD, it is neat that she is from Concord. Dawn, you're just gorgeous, and I learned so much about you from reading this. The Lace Reader tour sounds fascinating. I'm gonna have to go find your post about it. I had to giggle at your comment about the civil discussions. I completely agree. I've been on a few boards, belive it or not one is a cooking board that I go to for the great recipes, and I swear, my jaw has literally dropped at how nasty people can be to each other. I love the respect and kindness and yes - civility - of book bloggers.